One of the coolest new inventions unveiled during this year’s National and one of the most talked about items around the sports memorabilia blogosphere has to be the Ball Dome. Inventor/Collector John Weldon of The Memorabilia Factory has revolutionized the way collectors store their collectible baseballs. Recently I caught up with Mr. Weldon and asked him a few questions about his invention and collecting. What inspired you to create the Ball Dome? A few years ago I designed a holder for 8×10 wire photos. The baseball holder came later. While I was designing the 8×10 wire photo holder I would tell each person that I knew in the hobby what I was working on, many responded, “we need a baseball holder.” The final push was from Jimmy Spence. I had talked to Jimmy about the 8×10 photo holder at dinner one night and he told me I should make a baseball holder. So even though I finished the design for the 8” x 10” wire photo holder, I put it aside and proceeded designing the Ball Dome. How long did it take to develop the final product and what was the most difficult part of the design process? It took over a year to come up with a design of the Ball Dome. This was the most difficult process. We have many designs, but only this one met all the requirements that we needed to actually slab a baseball. What kind of response from consumers did you get during the 30th National? We had a tremendous response. We sold around 750 holders and around 260 holders with baseballs inside. We had various dealers that bought 48, 24, or 12 packs to try in their stores. We spoke with many of the larger companies about using the Ball Dome in the future to slab the baseball like baseball cards. We are currently working with one company and we are in contact with their production manager to begin testing. From the start, did you want the Ball Dome to bounce off the ground to show its durability or was that some type of accident you thought might attract customers? Yes, this was intentional from the beginning. We started with several types of materials during the material selection stage of the project. It started when we tested various cubes for durability. We would throw the cube on the floor to see if it would crack or shatter. Of course, they did shatter and crack. 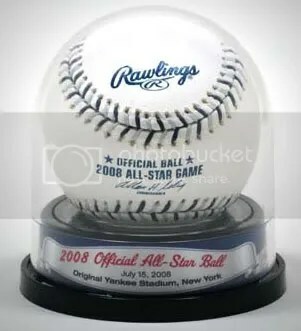 We wanted to make sure that if someone had a valuable baseball in our holders and it fell off a shelf that it would not get damaged. One material we tested withstood the strongest employee in the plant. He would hit the top of the dome with 20 pound sledge hammer. He hit is 20 times before it dented. However, we decided not to use this material. At the show, Dave Chronister who works in production took the ball and bounced it on the ground to mimic what he did in the injection plant. He did this for one of our first visitors at the booth. He wanted to demonstrate the strength of the Ball Dome. After we saw the reaction of the first potential customer, we knew we had to include this demonstration during the education process of the product. Every time we sent it crashing to the concrete floor, shivers shot down the spines of all the vendors that were around our booth. We just could not resist. It got the person’s attention and made them curious about the product. It was fun. We did give a free Ball Dome to each of the surrounding vendors for putting up with us throwing it on the concrete floor. Do you plan on making holders like the Ball Dome for other sports? Yes, the patent application covers other types of Ball Dome holders. We are working on a design for a tennis ball that we hope to have done very soon. We are hoping to roll out a full line by next year. Standard cube holders allow the collector to stack their baseballs. What do you have planned to help collectors stack/display baseballs stored in the Ball Dome? I did design a great way for the Ball Dome to stack. I like it better than the Cube. The problem with stacking the cube is that you have to un-stack everything on top to get to the cube on the bottom. With the cube, there is risk of causing the entire stack to fall over. The other problem is that once you move the cube, there is always the potential that the ball will move and you will have to open the cube and reset the baseball. This transfers more hand acid on the ball, plus you always have the risk of the ball falling out of the holder. Most of the time, I had my cubes taped so they could not accidentally open when I picked them up. If the ball moved I would have to cut the tape, reset the ball and tape it up again. For me this was a lot of work to retrieve a baseball at the bottom of the stack, so most of the time I just would not remove it. I will be announcing the new stacking product on our website www.balldome.com in a couple of weeks. This new stacking product will allow customers to retrieve any of the Ball Domes from the stack without unstacking the rest of the baseballs. I am glad I did not roll my first design at the show, because I came up with this better design while I was there. Do you have a personal collection? If so, what do you collect and what is your favorite piece? I have collected many types of memorabilia over the years: baseball, football, boxing, movie memorabilia and pin back buttons. I have collected so much that I keep it offsite in a temperature controlled secured storage area. Like most collectors, I have so many favorite pieces that it is hard to come up with just one. I wish I could say a baseball is my favorite piece, but my personal favorite comes from the boxing world. It may not be the most expensive item that I own but it has sentimental value. The item is a piece of boxing history. It is the mink gloves that Sony Liston gave Muhammad Ali (Cassius Clay at the time) during a press release of their first fight. As the story goes, Clay was being his usual witty self. Liston had never experienced anyone like Clay and he was upstaged at every press conference. Liston however struck back at Clay during a press conference right before the fight. Liston had someone take a pair of his sparring gloves and sent them out to be mink covered. He then surprised Clay by announcing to the press that he was going to use the mink gloves on Clay during the fight, so when he was knocked out, Clay he would not mess up his pretty face. He then gave the gloves to Clay, Clay was speechless; he was shocked that Liston could come back and upstage him. I have those gloves along with the original Sports Illustrated 11×14 press photos showing the entire sequence of that event. Clay has his mouth wide open in amazement. This was the first piece of memorabilia that I really spent what I considered at that time a lot of money. More than the price of the glove, my Dad was with me when I bought them. I bought them at one of the Boxing Hall of Fame inductions some years ago. I took him on the trip so it was just him and I. We had a blast together. That’s what makes the piece special. On YouTube, there are over 50,000 videos of collectors opening packs and boxes from all over the world. Watching other people rip open a product can really help you decide if it might be right for you. 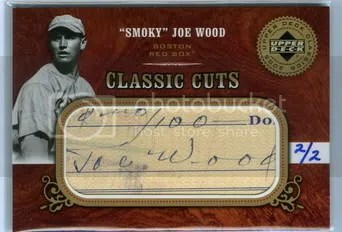 One of the most popular channels collectors subscribe to is FoxSportsCards, which is a card shop located in Marion, IL. Recently, I interviewed Dan Fox of Fox Sports Cards to learn more about the store, views on the hobby, and his collection. Can you tell me the history of Fox Sports Cards? When did it open & what inspired you to open a card shop? Fox Sports Cards opened in Dec. 2006. It was opened to address the fact that Marion had no Sports Card shop. There was only one small store in all of southern Illinois, and it was not doing a lot of the things I felt collectors were looking for. Our best selling items would be new wax, single cards, vintage and memorabilia. The wax sells pretty evenly across all price points. We do sell a lot of high end wax, but we also sell a bunch of med-level and lower-end wax as well. Baseball sells the most here in Cardinals country. Football is next, then basketball products, and recently we began selling hockey, and it has been really selling well. What type of events take place at your store? We host bi-monthly Trade Nights at our store every month. We try to host two or more autograph signings a year here at the store. Our most recent signing was New York Giants star running back Brandon Jacobs. We strive to have some Cardinal players every year as well as athletes from other sports. To be honest, I feel these signings are some of the most important things our store can do. They provide our young collectors a lifelong experience and memory of meeting some of their favorite stars in their home town. In your opinion, what is the state of the hobby right now? I feel the hobby is contracting a bit right now due to several factors. First, I put the blame directly on the stores and store owners. Sadly, many of the people who own card stores today are not only NOT promoting their store, they are NOT promoting the hobby at all. In today’s multi-media, tech-savvy world, if we don’t provide you some reasons to visit our stores a couple times a week, then why would you? I see too many owners bemoaning the state of the hobby, while they continue to do NOTHING to change its’ course. Our store and its’ business continue to expand and grow at a very strong rate. We promote, continue to change/evolve, bring in new products and try new/different promotions to give our customers many good reasons to visit us often. I also would put some blame on the big three manufacturers for the lack of support for brick and mortar accounts. Donruss, Topps, and Upper Deck have all turned a blind eye to many of the distribution problems plaguing the hobby. They have allowed wholesalers to start selling their products directly to consumers at pricing and at or below direct dealer account prices. These artificially low prices give the consumers the perception that the product isn’t worth the suggested retail price. It also allows pack searchers and the like to blend in online, and sell adulterated boxes on eBay and through websites looking just like every other online seller. Last time I checked, these online sellers have NEVER hosted a Trade Night, and NEVER brought any new kids into the hobby. They provide NO SERVICE at all to the hobby. Once they put the majority of card stores out of business, Wal-Mart and Target will be your alternative, and good luck with that. With all the advances in technology, do you find it difficult for kids to get involved with collecting? I feel its still very easy to get kids interested in card collecting. In many ways, that hasn’t changed since I started collecting in 1968, cards are cool. Its still a rush to pull your favorite player out of a pack. 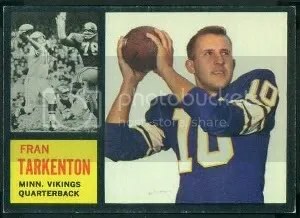 The fact that there are now autographs, pieces of jersey, stamps, coins, and all sorts of other quirky cool things built into cards today makes it even easier than it was in 1968 to spark an interest. Stores should have a presence on the web, you don’t have to sell, but at least be online, do some YouTube, Facebook, etc… Show the younger collectors that you will make an effort to market to their segment. Too many stores consider these steps to NOT be worth the time and trouble. Along these lines, I would love to see Topps, Upper Deck, and Donruss run marketing directed more at today’s marketplace. Think of how many collectors would get back into card collecting of Topps ran a 1 minute spot showing a collector opening a box of Triple Threads Baseball, or UD showing someone opening Premier Baseball, 60 seconds of pure marketing genius. Do you have a personal collection? If so, what is your favorite piece? I do still collect. My favorite pieces are my 1962 Topps Tarkenton rookie, 1955 Bowman Willie Mays, Smoky Joe Wood cut autograph, Adrian Peterson rookie auto, and an autographed card from Pete Pihos. What has been your favorite box of cards that you have opened? My favorite box of cards to open is either Premier baseball (or football or basketball), Triple Threads baseball (or football, or basketball). What are some of the biggest pulls that customers have received? We’ve had a couple Pujols autos pulled, a Sandy Koufax auto, some Honus Wagner relics in Topps Sterling, Michael Jordan auto out of Black, Jordan auto out of Premier, and a Jordan/Magic/Bird/Irving quad auto pulled in Black as well. I would like to thank Mr. Fox for taking the time to answer my questions. If your ever passing through Marion, IL be sure to stop by Fox Sports Cards.